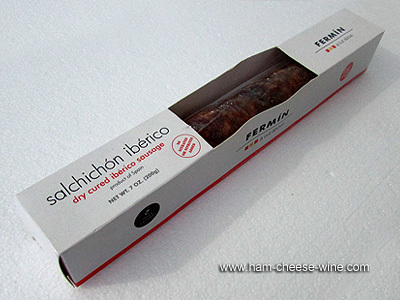 Iberico Salami Fermín is a flagship product from Spanish cuisine, it is a handmade product that comes from La Alberca, Salamanca, Spain, seasoned with sea salt and black pepper. Hung to cure in the fresh mountain air for several weeks, the Iberian pig pure flavor shines through in every delicious bite. Made from pata negra pig of the Iberian Peninsula, Iberico Salami Fermín is ready to slice and serve with a good Spanish red wine. Fermín factory employs traditional recipes and methods, mostly artisanal crafts, which are transmitted from generation to generation. All hams and sausages are cured in a mountain village of La Alberca, Salamanca, Spain where fresh air is an important factor in the curing process, and under the supervision of true masters, for whom the product quality speaks. Iberico Salami Fermín is made from black Iberian pig meat. 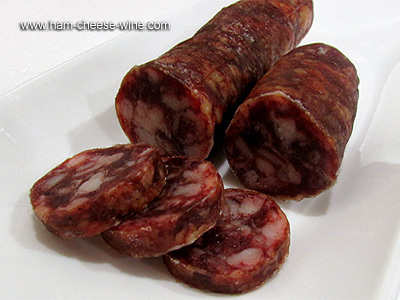 This pig meat is dark red and marble with delicate fat, ideal for the preparation of this intensely flavored salami. The quality of this pork is only one step below Iberico de Bellota quality. 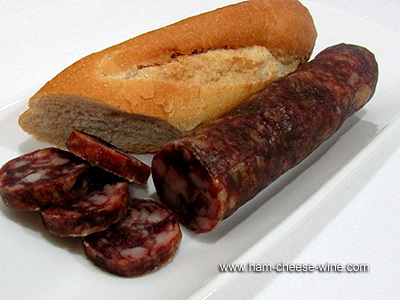 Iberico Salami Fermín is one of the typical culinary gems of western regions of the Iberian Peninsula. Sausages from Salamanca area constitute a guarantee for consumers to purchase and enjoy a quality product, ecological and natural, created under unique conditions. Iberico Salami Fermín is a cured sausage with unique characteristics, made of meat from Iberian pigs mainly fed with high quality grain and acorns, consumed during the open range stage. This minced and chopped meat to which pepper and sea salt is added is considered a very high quality product. Iberico Salami Fermín is ready to cut and serve, needs no refrigeration, is a delicacy in sight, a delight in smell and a gift to the palate. 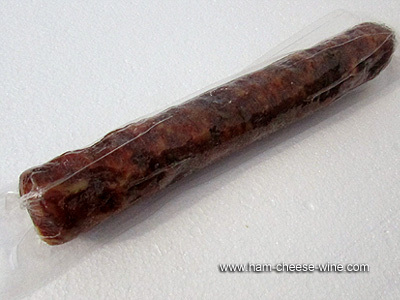 To keep an Iberico Salami Fermín, some measures apply. First remove the skin only to what you will eat. Save the rest in a place without light, cool and dry, a cupboard or pantry is ideal. All cold cuts, but especially salami, undergoes transformations both in its color and its flavor when exposed to light for short periods of time. Seal the cut with a plastic film and wrap the rest with a cotton cloth. And especially, do not hang off the kitchen, keep it horizontal in the pantry, as temperature changes deteriorate the taste and texture, and even dilute the fat if it is an Iberian sausage. Spain, shines through every delicious bite. It is seasoned with salt and pepper, and in some cases with grated nutmeg and a pinch of coriander. Iberico Salami Fermín comes in two formats: small sausage for the cutting board and a large sausage for slicing, both top quality, a delicacy for the most discerning palate. The flavor and texture of Iberico Salami Fermín is such that it deserves to be ranked among the best Iberian pork products. 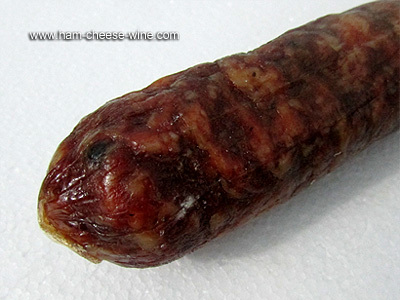 It is made in a sausage-like manner but without the use of paprika. Total Fat content is 12g 19%, Saturated Fat 5g 21%, Cholesterol 21mg 7%, Sodium 470mg 19%, Total Carbohydrate 0g, Dietary Fiber 0g, Sugars 0g, Protein 7g. Fermín was the first producer of hams and sausages to be approved for export to the USA. This family business is housed in the beautiful village of La Alberca, in the mountains near Salamanca. The cold, dry air season and short summer are ideal for curing hams and sausages in the Spanish way.